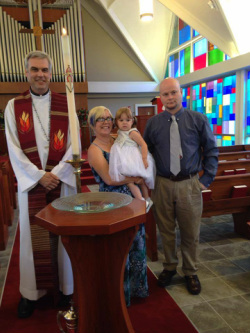 At First Lutheran, we lift up the gift of Baptism within the community of faith. We rejoice in baptizing people of all ages and we promise to support and partner with you as you or your child grow in faith. Some parents who have family in the area come “home” to First Lutheran even though they worship in another faith community. You need not be a current member of First Lutheran to be baptized, but since being involved in a community of faith is part of the baptismal promises, please let us know where you are currently active in worship. Also, infants and children baptized at First Lutheran are considered members whether their family is or not. Please contact the pastor or the church office if you would like to be baptized.